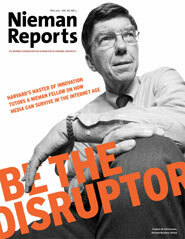 Harvard Business School professor Clayton Christensen has an important article in The Boston Globe today on the disruptive changes coming to higher education, arguing that the fading away of MOOCs (massive online open courses) will amount to nothing more than a temporary reprieve for the old way of doing things. Ultimately, Christensen and his co-author Michelle Weise argue, college and university administrators will have to deal with “disruptive innovations” coming from the outside as they find that their high and increasing costs are unsustainable. In the fall of 2012, Christensen and two co-authors — David Skok and James Allworth — wrote the cover story for Nieman Reports, “Breaking News,” on the challenges facing the news business in a time of disruptive innovation. Given that context, Christensen’s appearance in today’s Globe would appear to be a side effect of the “jobs to be done” thinking that has already permeated John Henry’s news organization. Why is The Washington Post holding a live event in Boston?